About a dozen years ago, the notion of bringing a pristine asteroid sample back to Earth was one of those “wouldn’t it be cool if…” things nerdy scientists kicked around over a few beers. But after one of those bar-table discussions Dante Lauretta and a few of his colleagues decided they might just be onto something. So they spent seven years writing and making proposals, and finally won enough support from their colleagues that NASA agreed to fund the concept. The idea has since become a spacecraft, OSIRIS-REx, now resting in a hangar at Kennedy Space Center. The rocket that will launch it into deep space on Sept. 8 stands nearby. If all goes well for OSIRIS-REx over the next two years, it will fall into orbit around the 500-meter asteroid Bennu, and spend the next 700 days carefully studying the asteroid to determine where best to try to grab a sample for a return to Earth. Only then, sometime in July, 2020, will the real challenge begin. How, exactly, does one reach out and grab some pebbles off the surface of an asteroid and live to tell the tale? Ars spoke with Lauretta, a planetary scientist at the University of Arizona and the mission’s principal investigator, to get the details. As the spacecraft moves near Bennu, the arm will slowly extend toward the asteroid at a rate of 10 cm/second. Once the sampling head makes contact, one of the three nitrogen bottles will expel its contents downward, pushing dust or rubble at the surface upward, into a capturing chamber that can accommodate small rocks up to 2cm across. Additionally, along the base plate of the filter, there are 24 contact pads that will contract, each with the capability to grab particles up to 1mm across. 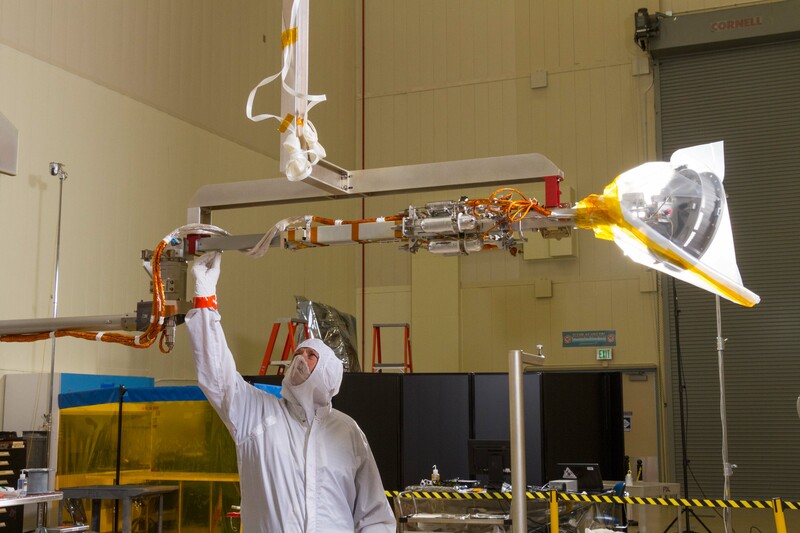 Enlarge / The Touch-and-Go Sample Arm Mechanism is tested in the Lockheed Martin facility. After this explosive maneuver the spacecraft will back about 10 to 20km away from Bennu. By measuring the spacecraft’s moment of inertia scientists back on Earth will be able to determine how much material OSIRIS-REx actually grabbed. The science requirement is 60 grams, but in microgravity and vacuum chamber tests, the sampling arm has collected between 400 and 500 grams during most attempts, Lauretta said. And if the initial attempt fails? The spacecraft has two more nitrogen bottles to fire, so it can make two more attempts. A successful mission presumes there’s enough loose material on the surface of the asteroid to actually pick up. While they can’t be sure that’s the case with Bennu, Lauretta and his team have tried very hard to find an asteroid that will accommodate their needs. Asteroids are everywhere, but not just any one would do for OSIRIS-REx. Because the spacecraft isn’t powered by a radioisotope source, it must rely on solar power, and so the science team looked for a near-Earth asteroid within 1.6 astronomical units of the Sun (the Earth-Sun distance is 1 AU). In addition, the mission planners did not want to go closer than 0.8 AU to the Sun because they were concerned about burdening the spacecraft with special cooling equipment, such as large solar shields. They were further constrained by the heat shield on their return vehicle, so they had to look for asteroids on orbits inclined to 10 degrees or less. That got them down to fewer than 200 asteroids. Within these constraints, the scientists looked for a larger asteroid because they have found that boulders smaller than about 200 meters across tend to tumble rapidly, as much as one revolution per minute. With such high rotational speeds, the scientists worried that smaller boulders might have very little loose material for the spacecraft to grab. Finally, and perhaps most importantly, Lauretta said the team wanted an asteroid with pristine, organic materials. Just five asteroids fit all of the other criteria and possessed spectral properties of carbon-rich surfaces. Of those, Bennu had one additional benefit: observations by Mike Nolan, at Arecibo Observatory, had allowed scientists to carefully track its orbit, and provide information about its shape. Enlarge / Dante Lauretta. Asteroid scientist. 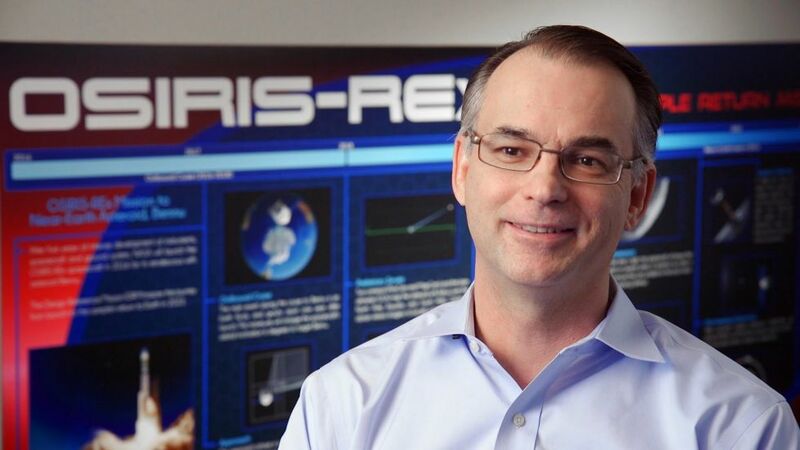 OSIRIS-REx principal investigator. With a rotational period of 4.3 hours, Bennu is spherical with a bulge at its equator, looking something like a spinning top. To Lauretta and his colleagues, this suggests that material from the poles is migrating to the equator, and the ridge observed there is something of a loose rubble pile. That would be perfect for OSIRIS-REx to sample—if indeed it is a rubble pile. But it’s hard to know for sure until a spacecraft flies there and finds out. Meteorites hit Earth all of the time, many of them originating from asteroids. But when it comes to doing asteroid science—and as an asteroid scientist that’s how Lauretta became interested in this in the first place—there are problems with meteorites collected on Earth. They have been contaminated during their time in Earth’s biosphere, and the most interesting bits, the clays and organic molecules in carbonaceous chondrites, are often destroyed during their passage through Earth’s atmosphere. Finally, it’s difficult if not impossible to trace a meteorite on Earth back to the asteroid from which it came. With OSIRIS-REx, an approximately $1 billion mission including its Atlas V launch vehicle, scientists will be able to control the source of the asteroid material, keep it free of Earth-based contamination, and preserve any organic molecules of interest. And that’s the key—planetary scientists are on the hunt for the organic precursors to life that might have existed in the early solar system. Notably, if key organic chemicals are found on asteroids it means that places like Mars and the Jovian moon of Europa were bombarded with the precursors of life billions of years ago, too. OSIRIS-REx isn’t the first mission to rendezvous with an asteroid and return samples to Earth. Japan’s Hayabusa spacecraft arrived at Itokawa in 2005, but experienced some difficulties with its sample collector, so it returned only about 1,500 dust grains. The Japanese probe also visited a stony asteroid, rather than a carbon-rich one, like Bennu. Nevertheless a follow-up mission, Hayabusa 2, is en route to a carbonaceous asteroid. It won’t have the capability to go into orbit around its target like OSIRIS-REx, but it does have one key advantage—it is due to return to Earth in 2020. The NASA mission won’t return its sample to Earth until September, 2023. Lauretta insisted the two teams have a good working relationship, and have helped one another out. If both missions find organics, it would send a powerful message about the origins of life.